Samantha is an Indian actress and model who made an established career in Telugu and Tamil Industries. She is very choosy about her dresses. She prefers to wear both trendy and traditional outfits. 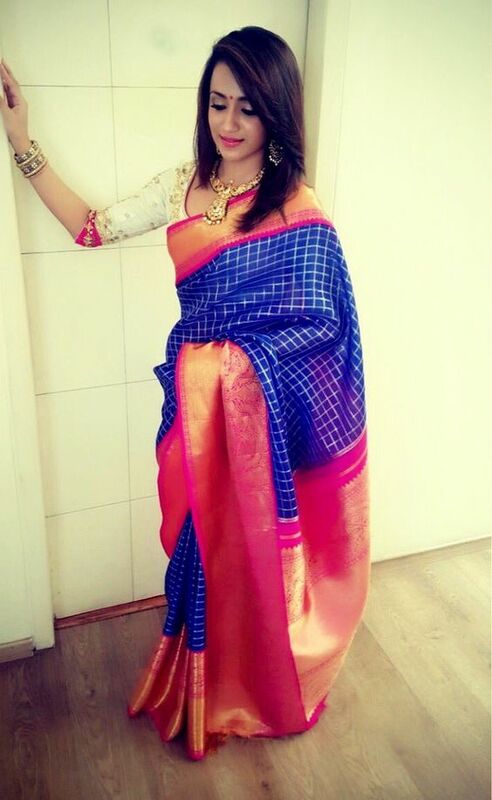 Wedding sarees worn by Samantha are very much noticed in south India since it is something very special and unique. Not only the wedding sarees but her blouse designs also have some uniqueness. Samantha got engaged to Mr. Naga Chaitanya and her engagement saree had her limelight love story embroidered on it. Here are some Indian wedding saree blouse designs worn by Samantha Ruth Prabhu that you can prefer for your wedding day. Sania mirza performing a ramp walk for kanjivaram Indian wedding saree at iijw fashion show. she wore a beautiful purple color saree with full zari tissue work . This saree comes in 9 inches big border and it matches her beautifully. She wore a contrast color rose sleeveless blouse. The whole attire adds glam to her look. Her jewelry was complete with white necklace and white earrings. Below is the beautiful parrot green colour indian wedding saree made from Kanchipuram . it has lovelyflower design made with pure zari and the border is made in contrast pink colour . Only saree can reveal the perfect figure of a girl and neatly draped wedding saree gives additional attraction. Parrot green goes well with women who are brighter in skin colour. The other advantage of saree is that, even if you are put with little weight . women in saree will look great. 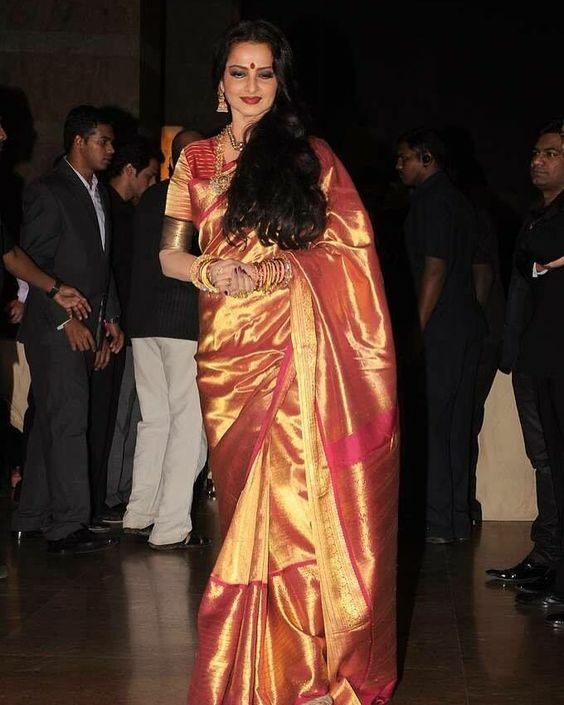 Actress Rekha looks stunning in a indian bridal wear maroon colour full gold zari wedding saree made from the silk city of tamil nadu - Kanchipuram. Her kanjivaram wedding collections are a treat to watch. the saree is completely made in full zari gold and is completely plain without design. It has 16 inches big border and it comes with maroon colour silk and full gold zari in to it. Trisha in Royal blue inidan wedding saree with big border contrast pink colour. The saree design has full stripes all over the saree and border is in 9 inches big border saree. she wore white colour blouse which has very good embroidery design. 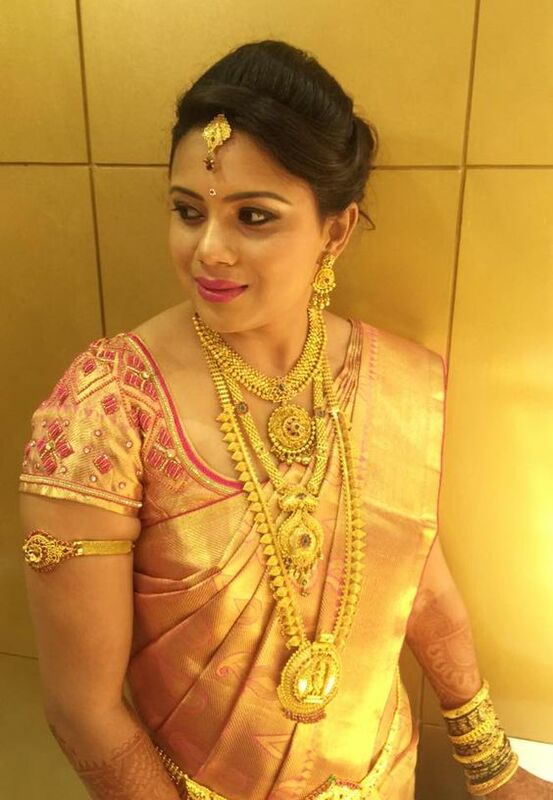 Actress Sneha in a beautiful yellow colour wedding saree with pink and gold contrast border. she wore a macthing pink colour blouse matching the wedding saree. The blouse has beautiful hand made embroidery work. she wore a indian temple jewellry and jumkis. Last but not least , a fresh jasmine flowers to complete the style . she looks like a perfect south indian bride in this all overall well grommed style. South indian bride looking gorgeous in a full gold zari wedding saree. the wedding saree is made completely with full gold zari and has small buttas design all over the body of the saree. border is self border. this is one of the toughest sarees to make . it takes almost 45 days to make one saree and is made completely handwoven. this saree can stay for a long time and without any damages. a must have saree for bridal collections. Anushka in a beautifulchilli red kanchipuram wedding saree. the saree is almost plain with leafy design golden zari buttas spread along the body of the saree with 4 inches golden border. she wore a matching chilli red blouse with golden border.Her charming looks with this chilli red kanchipuram saree adds extra glitterness with a perfect temple background. Deepika padukone in silverish colour wedding saree. The saree has lot of embroidery work and she looks stunnigly beautiful in that saree. she wore this saree at an international jewellry week function in 2010. Farah Khan was the jewellry designer. Lakshmi Manchu in a beautiful indian wedding saree made from the city of kanchipuram. It is pure silk saree with pure zari completely handwoven. The saree of the body comes in off white and orange colour and the border in golden zari. Zari is completely woven all over the saree to give a blistering and beautiful look. she wore a matching elbow size blouse in cream colour. she also wore a matching hara in white and orange beads. When it comes to being stylish, there is none better than lakshmi manchu.